My family has had a challenging week but it has been an amazing opportunity to reflect on the life and heritage of a beautiful grandma who loved and served her family and Jesus Christ with all her heart. I talk a lot about innocence on fieryhalo because it’s something I value. I was noticing this week that one of the precious attributes my grandma passed down to her children and grandchildren was a passion for child-like faith and living wholeheartedly in the moment. This is probably one of the reasons it’s a primary theme in everything I write. My mother’s entire family made a pilgrimage from all over the world (one cousin even came from France with her little girl, Anastasia, who just turned 4) to be at the log cabin my grandparents bought in the backwoods of Wisconsin a number of years ago. The only explanation any of us can think of for such a bizarre retirement move on their part is that their Norwegian roots beckoned them to the colder climate; it’s the nearest to heaven on earth they could imagine… until now. 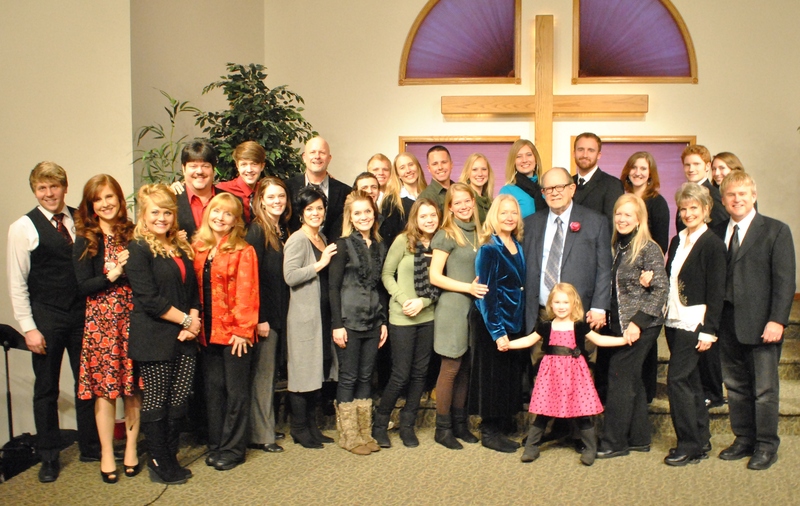 On February 28th, 2012, we had a memorial service for my grandma, Donna Murk, who died the day before Valentine’s Day. It was a time for music, memories, family, and food – all the things Grandma loved most consolidated into two wonderful hours. personified in the brilliant smiles and happy tears on the faces of her children and grandchildren. This is her legacy: an adoring husband, 5 children, 15 grandchildren, and 3 great-grandchildren (and another one on the way) all serving Jesus Christ – 11 of that number in full-time ministry. We all had plans this week but enjoyed the blizzard that kept us cabin-bound under 12 inches of snow along the banks of the frozen Chain lake. With so many people in one cabin, there were times (especially mealtimes) it felt like mass pandemonium in here but the sounds were like the music of heaven: sharing stories, roasting marshmallows over the fire, back-rub trains, children laughing, snowball fights, walks on the lake, stargazing, painting nails, chopping wood, cooking, spilling, slipping, hilarious outbursts of laughter, games of chess, and on and on. We all agreed this is a foretaste of the heaven Grandma is already enjoying. The past two nights have been late as we’ve all cuddled up by the fire, wishing time would stand still just a little bit longer. It’s not Christmas but we could realistically sing “the weather outside is frightful but the fire is so delightful and since we’ve no place to go, let it snow, let it snow, let it snow.” With the roads cleared, however, our excuse is now gone. So this morning, after 48 hours of precious moments, recounting family memories and jokes and making new ones, a couple of the families said goodbye. This afternoon, a few more said goodbye. And finally, tomorrow, we say our goodbyes even as Grandpa lays his hands on each one and prays God’s blessing and protection over his family. The last time we were here, it was difficult to focus my heart and attention on celebrating life when the smell of death was hanging in the air (you may remember when I posted Moosetracks & Memories). This time, the freedom in the air was palpable and sent everyone tumbling out into the snow to play and enjoy the warmth and fun of family. I love every reminder that life is short but it’s what we’re here for. The Bible put it this way, “For if you live according to the flesh, you will die; but if by the Spirit you put to death the misdeeds of the body, you will live. 14 For those who are led by the Spirit of God are the children of God. 15 The Spirit you received does not make you slaves, so that you live in fear again; rather, the Spirit you received brought about your adoption to sonship. And by him we cry, “Abba, Father.” 16 The Spirit himself testifies with our spirit that we are God’s children” (Romans 8:13-15). This entry was posted in Memories, Travel Journal and tagged adventure, attitude, beauty, bereavement, cold, death, family, Hope, Innocence, Life, music, perspective, Relationships, wisdom. Bookmark the permalink. It sounded like you and your whole family had a pleasurable experience celebrating the legacies of your grandmother at the memorial service! It truly amazes me to discover that you and your family have stood the test and have maintained an optimistic attitude even during the most unforgiving circumstances in life. I know that death, especially the death of a loved one is one of the most depressing moments, but if you rest assure that your loved one is a believer who actively serves God and faithfully commits his/her life to the Lord Jesus Christ, then you would have confidence that you will see your loved one in a better place! I think that your grandmother is a very special person, and it is such a joy to hear that she is a strong Christian who values Jesus Christ and lives to serve him to the fullest of her potential. I have a grandmother like that too, and I am absolutely grateful for her. She is a believer who never ceases to walk with God, and she is such a great role model to me as she continues to embolden my family and me to testify our faith in Jesus Christ! Also, she hardly gets ornery or cantankerous, even if she encounters the most insurmountable challenges in life. This is why at times, my grandma reminds me of you – you both are similar in terms of attitude toward hardships and spiritual relationship with God. I will continue to keep you and your family in prayer and ask God to strengthen the faith of your other relatives. That’s a precious compliment, Hoang-An. Thank you. You’re welcome, Brittany! All that I said to you really comes from my heart. 🙂 I honestly think that you are such a special friend!